Male red-bellied woodpecker (Melanerpes carolinus) on locust tree in Madison, Wis., October 27, 2017. Even though I’ve taken more bird pictures than I can count over the past two afternoons, I wanted to share with you these photographs from two weeks ago because red-bellied woodpeckers are awesome, and I’m overdue in featuring them on my blog. With how sunny it’s been the past couple days, it would be perfect conditions for taking a good, clear photo of a red-bellied woodpecker. So of course I haven’t seen one. I did see a hairy woodpecker yesterday (well, I heard it first as it tapped against a tree branch), but it flew away while I got my camera out. 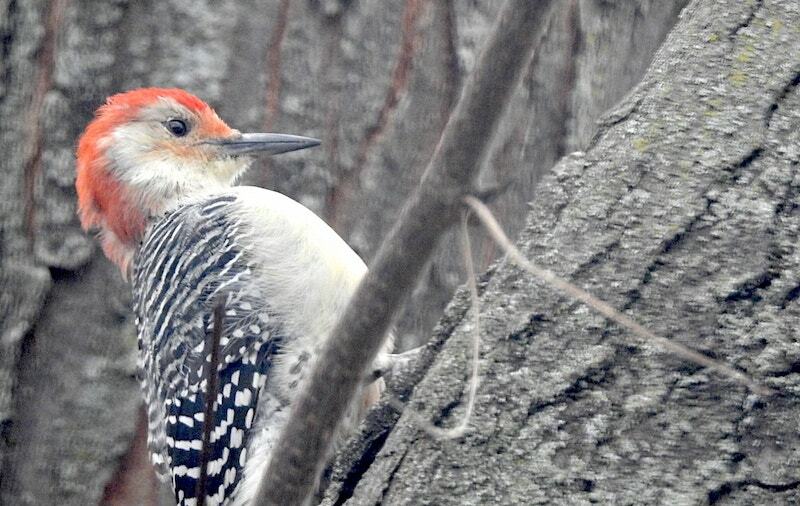 Red-bellied woodpeckers belong to a different genus that the hairy and downy woodpeckers I’ve written about before. Those are in the Picoides genus; the red-bellied belongs to Melanerpes, which is from the Greek for “black creeper.” There are several species of the Melanerpes in the United States, but the only other one found in Wisconsin is the red-headed woodpecker, which I have yet to see in the wild. 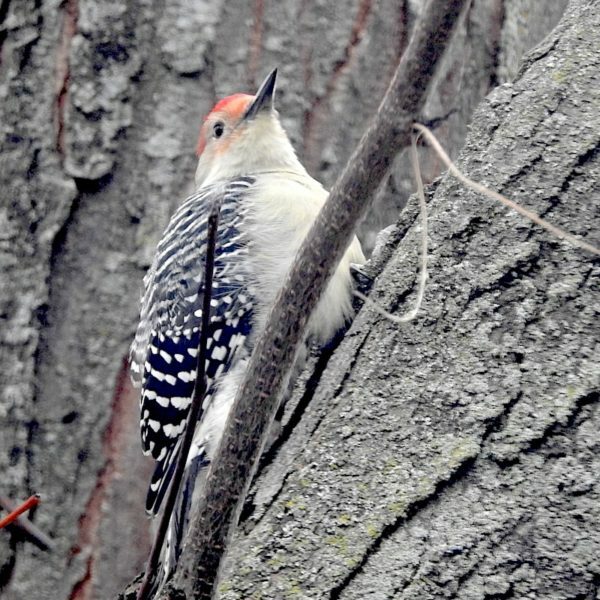 Do red-bellied woodpeckers have red bellies? It doesn’t look like it from the photos, does it? The visible area of this one’s belly is very much white. But they do actually have a red patch among all that white. It’s just so low—down between the legs—that it’s hidden when the bird is sitting. Why aren’t red-bellied woodpeckers called red-headed woodpeckers? It would make sense to call them red-headed, since both males and females have noticeable red patches on the head. The male’s patch covers the back and top of the head, while the female’s only covers the back. In either case, the head patch is easier to spot than the red belly patch. But we already have a woodpecker called the red-headed woodpecker, and it’s head is even redder. (Go look.) So it won that name in the English language.